Our venue was changed from Maidens Cove to Tabelberg Road parking lot, due to the direction of the wind. We paint with this amazing lady who knows all these things due to many years of painting en plain air. For those who don't know Cape Town, this road runs along the base of Table Mountain and the Cable Car lower station is situated on it. In every direction there are spectacular views. Now I start my brush miles in ernest! 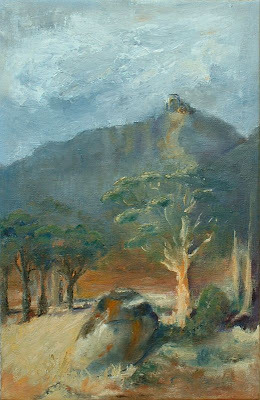 This was my first take on the area, looking directly up towards the cable car on the top of Table Mountain. This is one very imposing mountain. 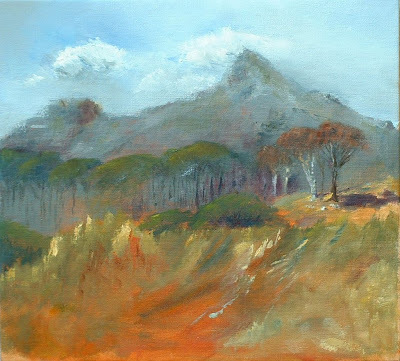 This was done the following week looking towards Devils Peak, Table Mountain is on the right hand side of this. You can see some of the burnt trees from the regular fires we have in March. Painting outside is incredibly difficult and totally addictive. While standing out there in the wind and sun in this spectacularly beautiful place we are so fortunate to live in, you get surges of excitement rushing through you. Very difficult to explain but you have to just keep going back for more! I think it is a bit like a drug. I am addicted! I absolutely love these two artworks. The colors are lovely and subtle and the use of the subdued orange compliments make the paintings vibrate. Jean, thank you so much for your kind words. They mean so much to me, especialy because this en plein air painting is so challengingly difficult and the results are so different to what I normally produce. I think that perhaps this is another huge growing experience in my journey of painting. Outside is definitely your thing! One day I'll join you and maybe paint treasures like these. These are the best you have done. Amazing colours and vitality in brush strokes, wow! I envy you - wish I could paint mountains. Hi Carolann. Thank you so much for those kind words! It really is so uplifting to hear such positive comments, as I am very definately undergoing another huge change in the way I paint and am very insecure about it! I am just trying to go with the flow so to speak and what happens, happens!Enjoying the process!